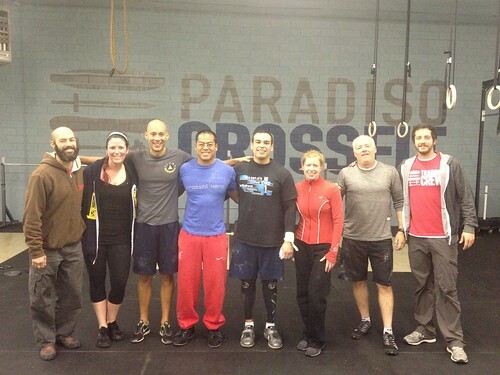 Home » WOD Blog » Updates, reminders, and unicorns! *One person works while the other rests. Scale the weight and height of box jumps to allow for continual movement. Each round should be a sprint! The rarely seen “dawn patrol” with the Unicorn known as Joe D.
For those of you that missed the Nutrition talk last week, we unveiled our new partnership with FarmboxLA. They will be taking over the duty and privilege I’ve had over the last 3 years of providing PCF with farm fresh fruits and veggies. The lovely ladies at Farmbox have extended PCF the “family discount” as well as the convenience of delivery to both locations. Here’s how it will work: just fill out the form (they are supplied by the check-in areas of both boxes) and return by Friday. Delivery day is now Monday instead of Wednesday. Fresh, clean, and chilled for your convenience, these baskets of goodness include a dozen free range eggs, nuts, fruits, veggies, and their weekly newsletter with paleo recipes, kitchen tips and more! Going forward, the plan is to have this fully automated (similar to Brian’s Bowls) with the ability to manage orders online. Order up! Reminder to check the schedule! More Open Gym time is ON! Practicing skills, performing supplemental strength work, and ‘playing’ around is critical to your development!